The Index opened flat and stayed in a narrow range mostly with negative bias making a high of 8355 and low of 8280 and then closing flat at 8324.80, small loss of 7.15 points. The broader market was also weak, with 700 advances to 802 declines. Developing Range as per Option Table is 8100-8600. 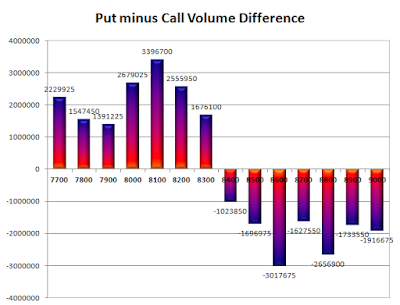 Call option 8400-8800 added huge 14.40 lacs OI with small short covering seen at 8200 and below strike prices. 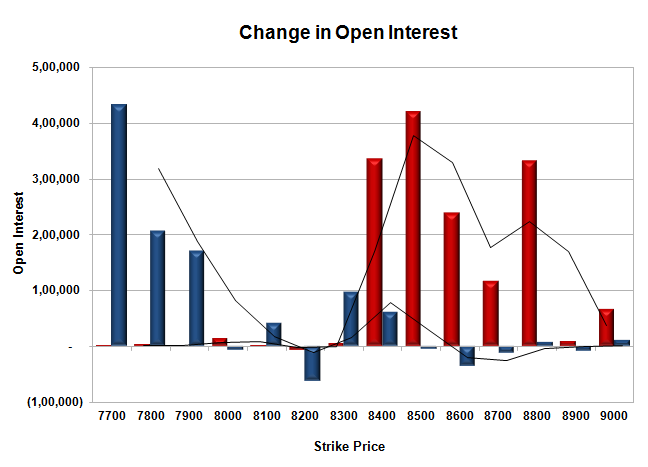 Put option 8300, 7900-7700 added 9.05 lacs OI with short covering seen at 8500 and above strike prices. 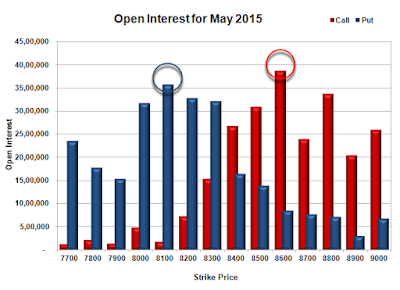 Nifty Open Interest is at 1,67,92,050 down by 15,46,900, with decrease in price, most probably huge long liquidation. 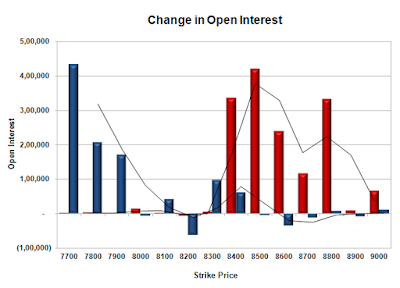 Bank Nifty Open Interest is at 17,90,000 up by 94,375, with decrease in price, most probably huge short build-up. FII’s sold huge 11.10 lacs Futures, which includes 43094 contracts long liquidation and 1290 contracts short build-up, with decrease in net OI by 41804 contracts (includes 38066 longs to 82450 shorts for the day) and the Average Price comes to 8861.02. FII’s Index future open contract as on date is 336091 Longs to 182655 Shorts, net long 153436 down by 44384 contracts. Initial support at 8300, with OI of 32.18 lacs and below that at 8200 with OI of 32.81 lacs. Initial resistance at 8400, with OI of 26.72 lacs and above that at 8500 with OI of 30.89 lacs. Day Range as per Option Table is 8237 - 8412 and as per VIX is 8249 - 8400 with 8320 as the Pivot.